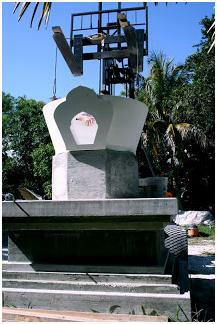 After living in Florida for a while, I noticed that every time I mentioned it to a Tibetan Lama I would hear, “Florida really needs a stupa.” For a stupa to have a strong enough effect, it would have to be at least 35 feet tall to give enough room for consecrated tsatsa, bumpas and relics. 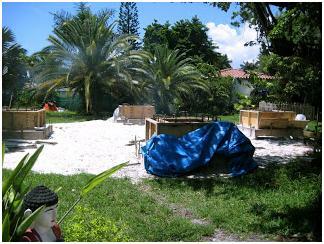 Open Awareness Buddhist Center had purchased property a few years ago, but there wasn’t room for a 35′ stupa, nor would it be allowed. 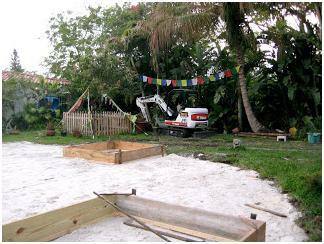 There even seemed to be a problem with putting in a small stupa as they are normally placed in the northwest corner of the land, which happens to be our rather small front yard. So, that taken care of we still spent some time hoping to get some land nearby through friends. When that didn’t work out, I finally had the bright idea of asking Lama Rinpoche if we couldn’t just built 4 small stupas in the back yard instead of one large one. The stupas would still afford us the space needed for enough tsatsa and other substances that a stupa of 35′ would give us. 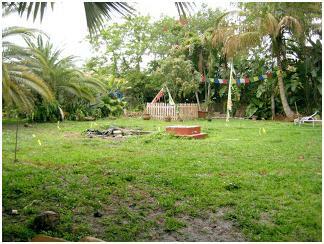 He thought it was a good idea and gave permission for the sangha of Open Awareness Buddhist Center to get started. The next steps — long before the consecration — were to get a local architect to draw the project out, get engineer’s drawings, take it all to the Village and pray for a permit. 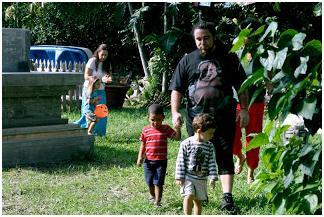 Luckily for Open Awareness Buddhist Center, these steps were not difficult. When we first acquired the property an architect, Rafael Amuchastegui, had visited with his wife, Dikka, who had recently taken refuge with Lama Norlha Rinpoche. 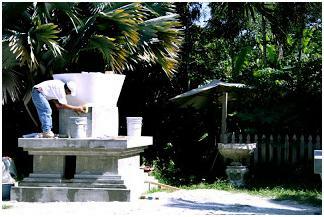 He indicated then that he would be interested in a stupa project, so I called him — years later. It didn’t matter. 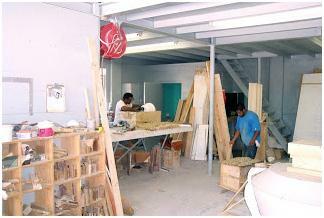 Rafael was here within a couple of days and soon after we had our site drawings. They were beautiful — the stupas sat in a mandala of circles so that people could circumambulate all four stupas and/or follow paths that encircled each individual stupa. 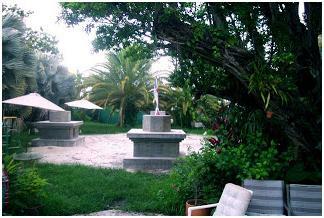 At that time we thought we’d keep a pond in the center, but that has since been scratched. Rafael and Dikka were incredibly supportive and generous. 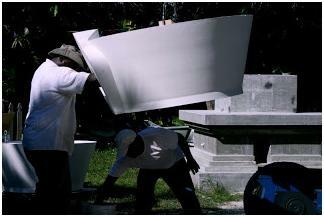 He would not do anything but donate all his work, the drawings, everything. 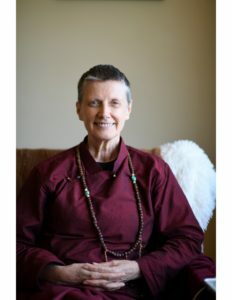 Lama Norlha Rinpoche was asked throughout these few weeks about when he would come to consecrate the land but the answer was always, “Wait till you get your permit.” And there was no indication that a permit would be easy to get. But another auspicious occurrence happened at the right time — a new meditator just happened to be a lawyer for land use and zoning. 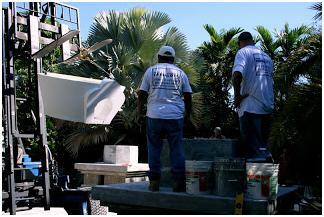 With Tony Recio’s expertise, we had our permit in about three weeks. 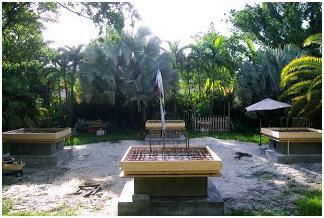 First, there was a large fire puja called Gelek Trinpung. 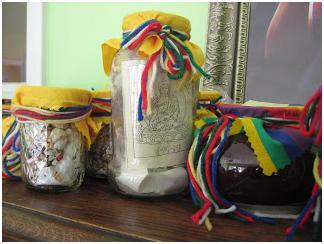 Since that text is long and only in Tibetan, I chanted it by myself as the sangha members made the offerings. 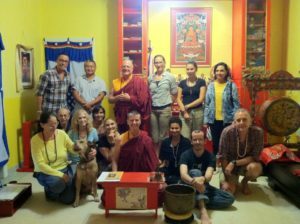 This practice is done at Open Awareness Buddhist Center once every month now so the practitioners are good at it and organize it well. They have also begun chanting along in parts. 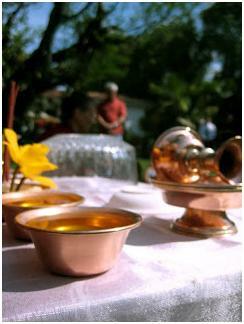 Part of Gelek Trinpung includes offering drinks like tea and coffee. For the actual consecration after the fire puja, we gathered together a large bowl of semi precious stones and crystals which were offered along with torma. 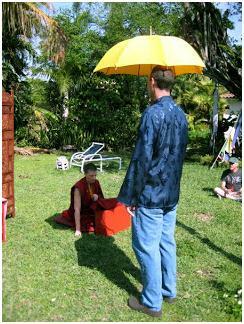 Then the Lama sits holding the dorje on the ground, meditating and chanting the mantra. 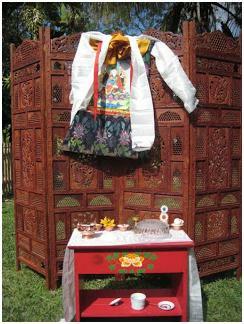 This is part of the outdoor shrine set up for the consecration which included bowls of saffron water, flowers, incense, a traditional Tibetan butterlamp, food and a conch shell as a symbol of music. 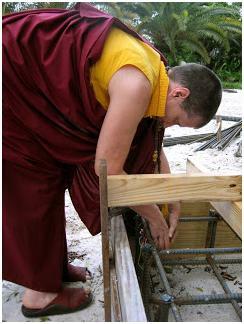 Once the consecration concluded, the land was free for building the stupas. These photos show the land just before work begins. It takes a day or two (or three?) 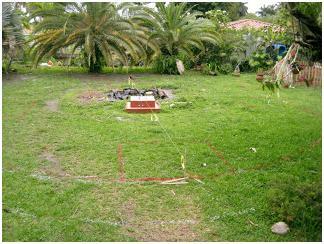 to mark out where the mandala will be so the ground is prepared in the right place. Here are a couple of stakes and a collapsed pond. Rafael visited to check it out and made a few changes. Other than that, we’re set to go. Main reason? A long-time member of the sangha who wishes to remain anonymous offered a large chunk of cash to get us started!!!! 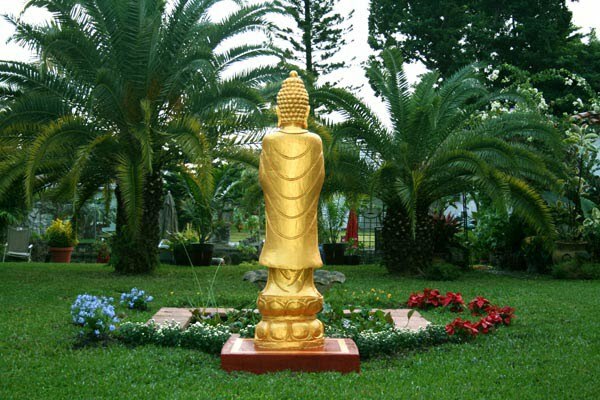 So the gold Buddha will rest for a while under the bougainvillea while we make an even better place for him to stand in the future. 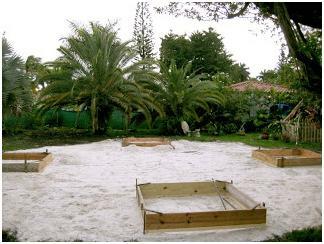 What we thought would take two weeks was accomplished in only 4-1/2 days — the preparation of the ground and getting the fill in. 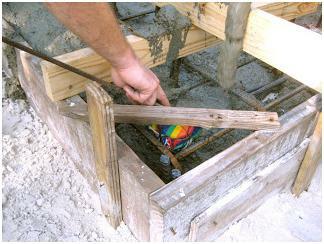 While they were doing that, the construction crew of two — Butch and Phil — built the boxes for the first pour. 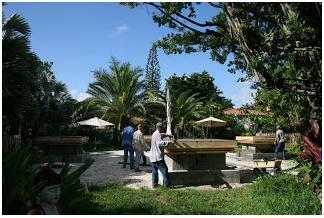 These bottom slabs are a bit over 7 feet square and are in the four cardinal directions. 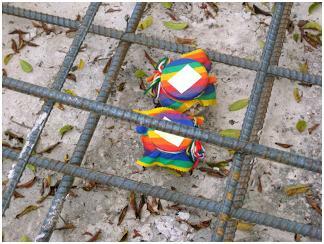 The rebar is in. The inspection has been passed. We’re ready for the treasure vases. 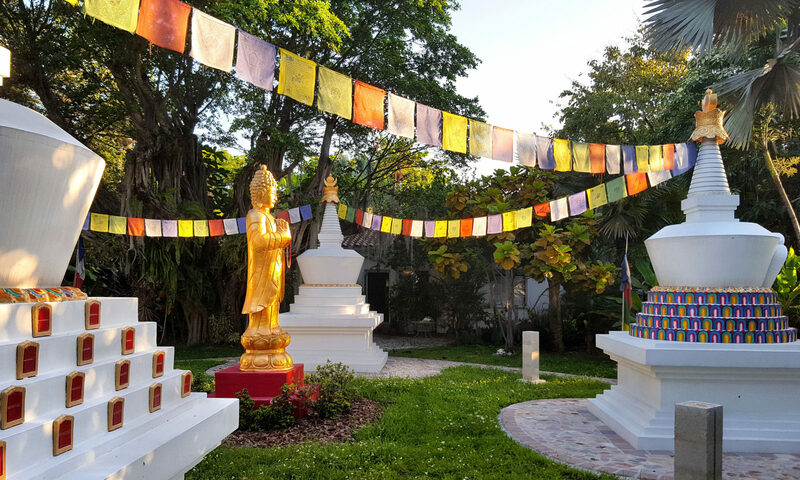 When I visited Lama Norlha Rinpoche at the monastery (Kagyu Thubten Choling) in February, the sangha in Florida purchased treasure vases and shipped them so quickly they arrived before I left. I thought we only needed 16 but Rinpoche ended up making 26. Some of them are marked “Naga” and are for the nagas and earth gods. Others are for Gonkar, White Mahakala. The treasure vase is a Tibetan tradition that goes back to the time of Guru Rinpoche, who gave specific instructions on how they were to be made and their purpose. 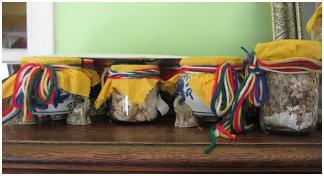 These vases can help balance the environment and promote healing of all kinds. 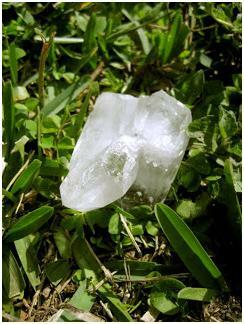 Here in South Florida the basic elements of earth, water, fire, air and space are all out of balance. These vases are part of the reason the stupas will be balancing them and will help avert negative forces of all kinds — storms, wars, etc. 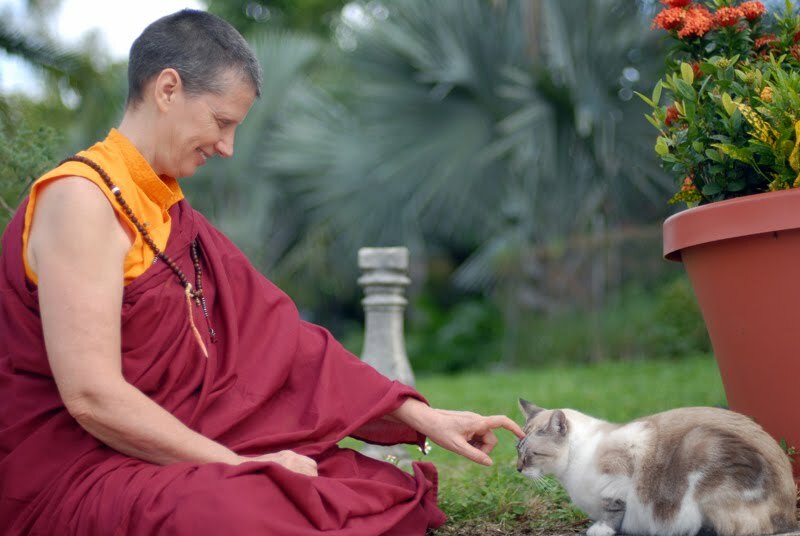 Lama Rinpoche sent some messages along with the shipment of consecrated vases, but we still had questions. 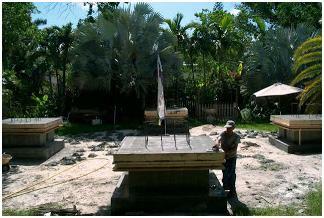 After asking around a bit, he finally gave the specifics of how they were to be placed in the first slab. 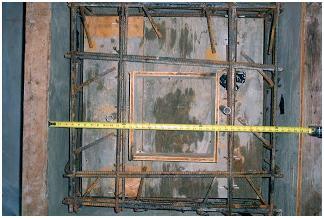 For example, the naga/earth god vases went in the middle of the slab in the bottom, two for each stupa. Other vases had to end up in the top half of the pour so that they would not end up underground. James Walton brought wire and an hour before the cement truck rolled in we were all busy trying to wire the vases in their respective corners or sides. 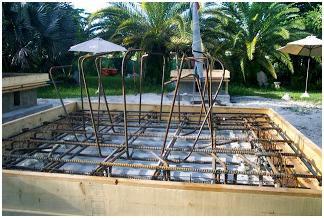 The rebar was certainly helpful then! 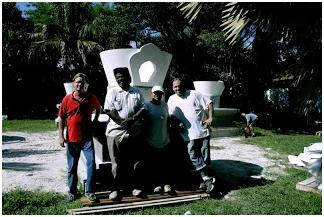 Tony and James are working here and below the two vases in the middle of the pour are waiting to be wired down. We finished with the last one as the cement truck pulled up outside and the pump was set up to send the cement all the way to the back yard to fill in the slabs. The vases are holding up. 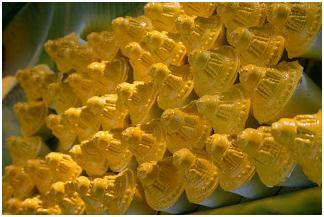 The pourers are very careful with them and let James know whenever they think one of them is moving. We have to keep them right side up. They’re holding up well here. This one needs a bit of help! With photos like these, there isn’t much need to write. Butch levels off the pour. Checking out drawings — a constant activity these days. And they’re all done. 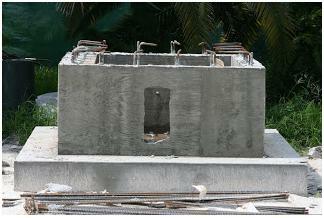 We even have extra cement piles all over the ground that may be used for another project on the land. 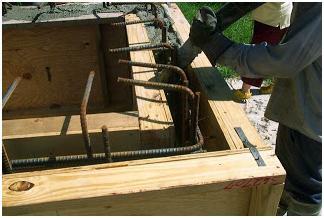 With the rebar already coming up out of the bottom slab, boxes are built around them to pour the walls. 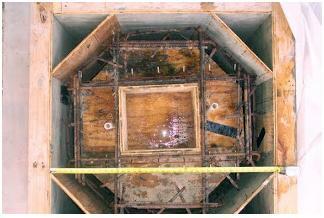 However, the inner space will have to be filled with consecrated substances so a small space about 18″ x 12″ is left. That’s supposed to be large enough, but looking at it now, it’s obvious we’re going to have to be a bit creative in order to fill in the entire chamber. 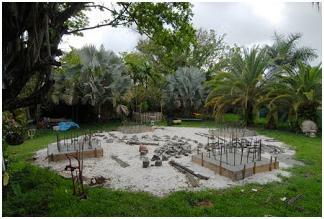 This photo of the yard gives a good idea of how large the stupas will be and how the mandala will fill up the space. 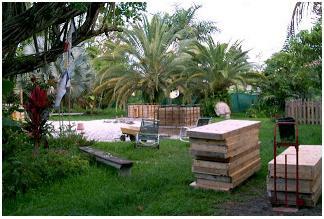 The way the yard is landscaped after the project is completed will be important. 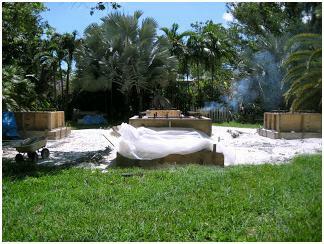 Smoke from the most recent fire puja spreads over the site. 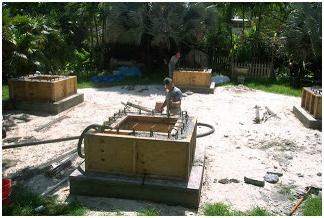 The second day of pouring begins early as Florida days are now getting very hot. 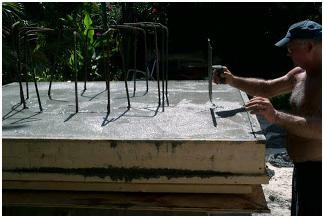 Happily, once the forms are made, the actual pouring doesn’t take much time at all. 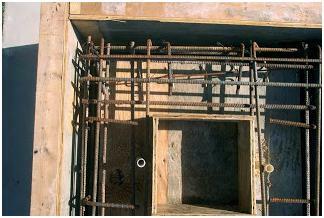 With all the rebar in there, we’re wondering how much cement can get in the form! 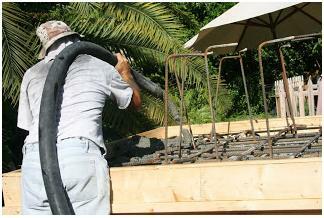 Butch watches carefully and pounds the outer boards to get rid of air bubbles. 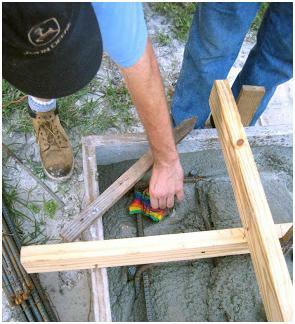 Leveling off the top of the pour so it’s fairly smooth. 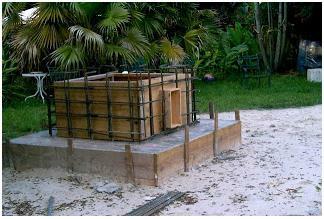 The next stage will be to pour the slab that covers the chamber and finishes off the throne parts of the stupas. 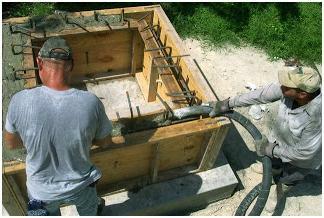 We are removing the plywood forms that held the wet concrete in place. 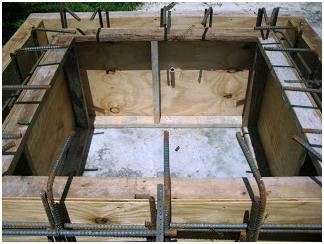 Removing the inside forms was tough due to the wood getting wet from rain and swelling up. 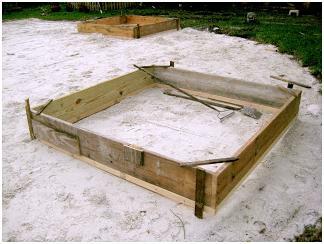 We used very large pry bars to do the work. 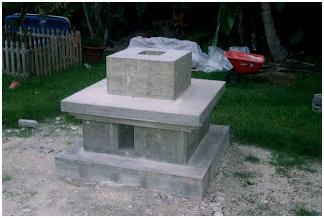 Here is the beginnings of the Stupa taking shape. 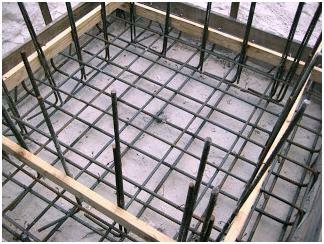 On the ground is the remaining rebar for the next couple of pours of concrete. 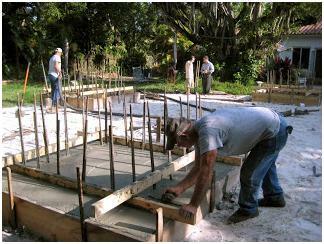 Two more pours to go on site. The bumpa and spire are being made off site and are being trucked in. 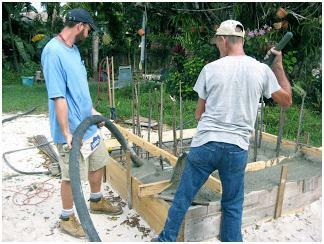 Butch and Phil are putting the wood up for the Deck pour. It was hot enough this day that we had Umbrellas out for shade. 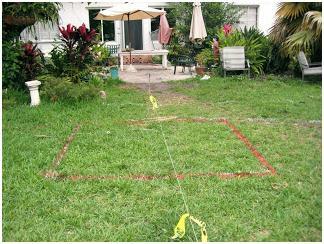 We are laying out where the steel for the next rise of walls is to go. 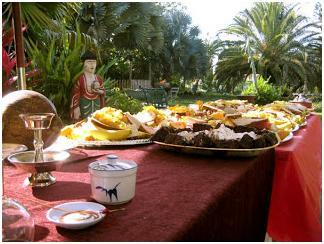 In the background is the smoke from the Fire Puja offering we had that morning. One complete form, three to go. 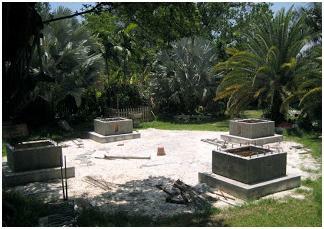 Little by little the Stupas take shape. 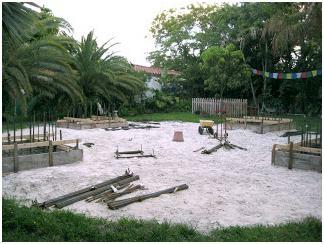 In the next few days the steel will be put in place and then time to pour! 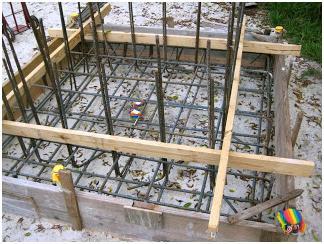 The steel has all been put in place and it is concrete pouring time. 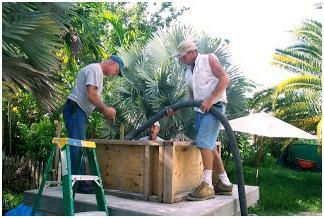 We had about 150 feet of hose in order to be able to reach all the Stupas. 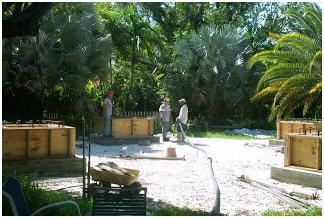 Leveling off the pours and finishing the concrete. 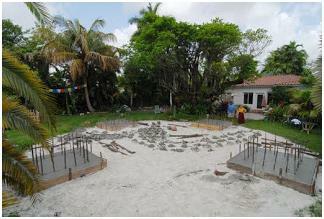 The concrete is dry and now the forms are off. 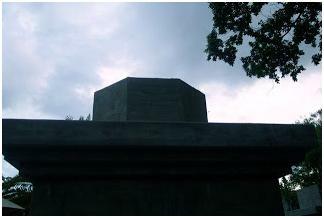 On the stupa at the left the form can be seen sitting on the edge. 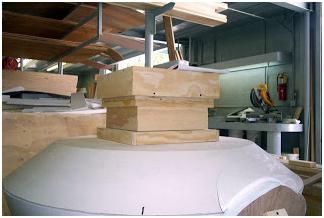 These are interesting shots taken by James, I think, looking down at the forms made for the primary pours on top the thrones. 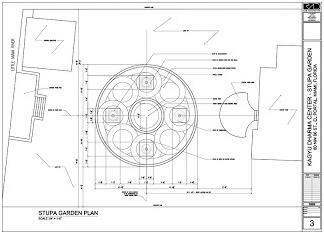 Two of the stupas will have square “boxes” and two forms have been made octagonal to allow for round levels on the secondary pours. This was a real work of art! 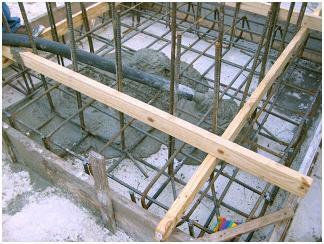 Cement fills in to make the second chamber of the stupa. All chambers will be filled to the brim with consecrated satsa, relics, etc. Last day of work on this project for Butch and Phil. Open Awareness Buddhist Center truly appreciates their involvement in the stupa project and the time and care they took to make sure each one was done perfectly. 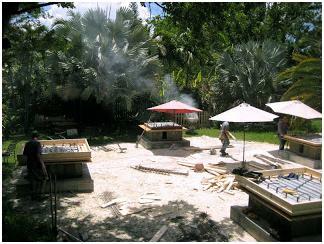 These shots show the stupas in the Garden of Merit, now awaiting only the outer secondary pours and the parts being made off-site by Herpel Casting. 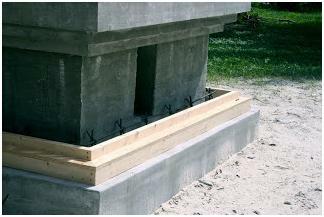 The outer pours will add steps both on the bottom slab and on top of the throne section which is actually everything in the photo below other than the top block. 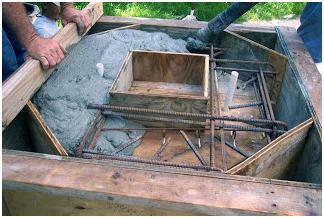 The three steps that will be poured on the bottom slab represent the three sources of refuge: The Buddha, The Dharma and The Sangha. 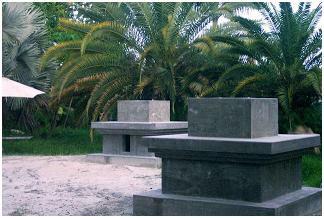 On top of the throne section, these two stupas will have four square steps poured. On the farthest one shown here, those steps will be where small doors will be placed as this is the Stupa of Many Doors. 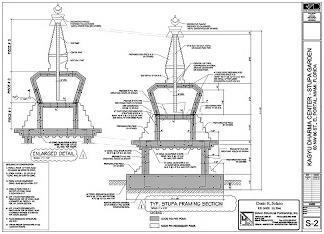 The two stupas that have octagonal blocks on the thrones will have round levels poured on top the throne sections. 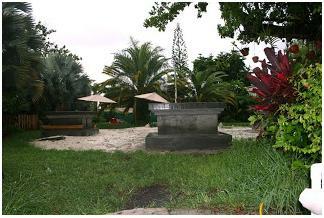 The stupa on the left here will have 4 levels, each covered with lotus petals. 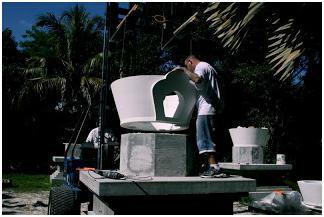 The other will have three round levels poured each of them with a small extention on the top. 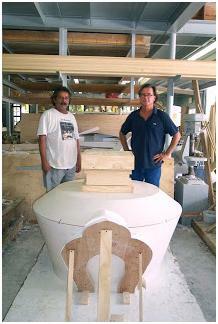 On your right is Rick Herpel, owner of Herpel Casting, and on the left a man he brought in just for this project. (I hope to find his name one day, too.) This photo gives an idea of the size of the bumpa and shows clearly the gau at the front. 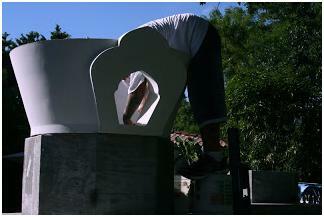 Since the gau is here cut from a piece of wood, we can easily see it. 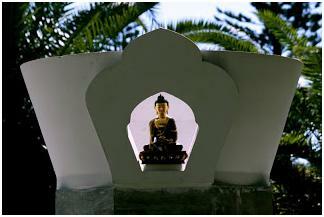 In the space of the gau will be an opening for a statue of Buddha Shakyamuni. Four statues have been commissioned by Lama Norlha Rinpoche to be made in Nepal, and four crowns for the tops of our stupas. 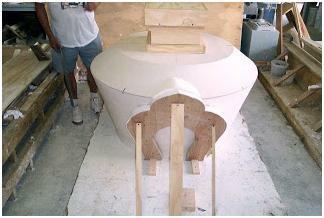 Working on the lathe forming the model for the mold of the chu kor at Herpel Casting in West Palm Beach. 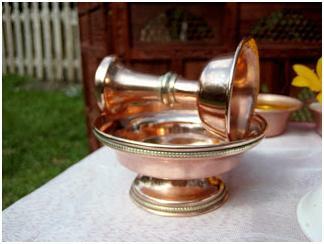 The wooden part shown here is called the harmika. 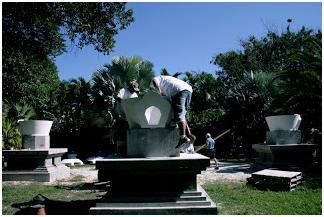 When the stupa is painted, this is where the eyes will be painted. First of all, I have to apologize to all our blog followers (and all sentient being,s of course) for the bardo, or the time in between, the last post I wrote and this one. A little event called “The First American Kagyu Monlam Festival” held in the woodstock, NY center — the American seat of His Holiness the 17th Karmapa — took up some time. It was a wonderful aspiration prayer festival with Khenchen Trangu Rinpoche leading and giving teachings each day; and with Khenpo Kathar Rinpoche and Lama Norlha Rinpoche in attendance for the full five days of chanting, it could not have been better. Karmapa’s sister was also there and Karmapa himself gave a short talk that was live stream from India. 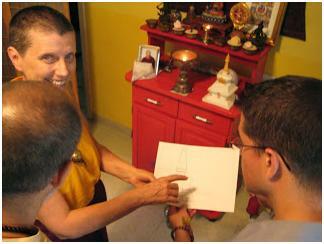 I was able through a friend to give Karmapa’s sister one of our cards to take to him. Maybe some day he will read this blog and send his blessings. 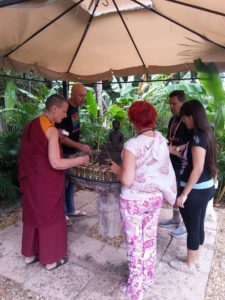 After the Kagyu Monlam, a few more people flew up from Florida to attend an empowerment Lama Norlha Rinpoche gave on Sunday July 25th. The next day Sengay the Dharma dog received his blessing from Lama Rinpoche, who actually threw Sengay’s favorite ball a few times! Sengay was ecstatic and did his very best fetches and highest jumps just for Rinpoche. He also, thankfully, did his prostration to Rinpoche on command. 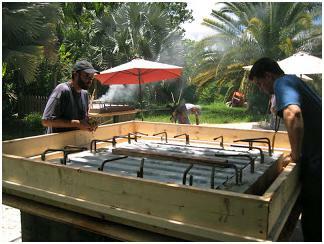 On the third day of driving home Sengay and I stopped at Herpel Casting to see the finished model of the bumpa, harmika, chu kor they will use to make the molds and pour the rest of the stupas’ main parts. 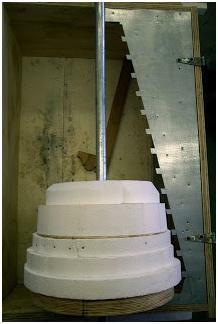 Under the guildance of Rick Herpel, they created the lathe (see photo above) used to make the model of the spire, the chu kor part. Chu means Dharma (teachings of the Buddha) and kor means circle. 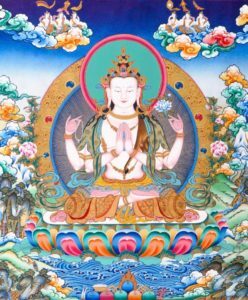 There are 13 circles in all, ten symbolizing the 10 Bodhisattva levels and the other three representing three essential remembrances. It is sometimes said that these 13 rings represent 13 Bodhisattva levels as the levels are sometimes spoken of as 13 rather than 10. The models were beautiful. Herpel Casting is doing a great job — and with great enthusiasm, too. 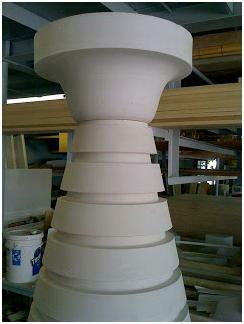 Here is the top of the chu kor, where the crown will eventually be attached. 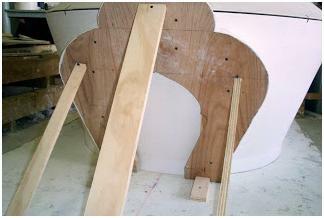 This top wil be poured as a separate piece, fitted into the top of the rings and sealed against any water intrusion. 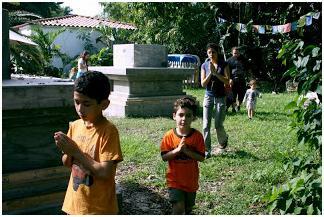 Last week the participants of Young Buddhists’ Day learned what circumambulation meant and how to do it. 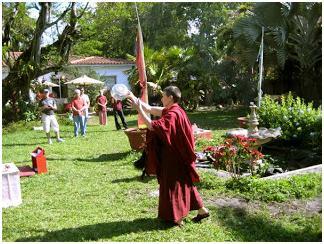 This month’s YB Day they learned how to enhance circumambulation practice by adding the recitation of the MANI mantra. 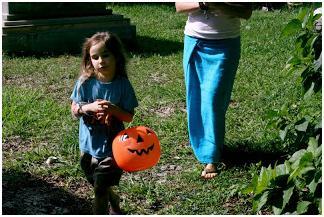 Some new children joined us this time and, of course, since it was the day before Halloween, all went home with treats… and pumpkin baskets to hold them. 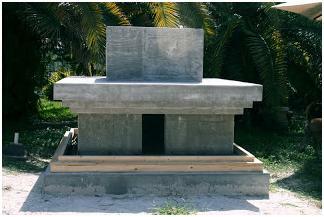 The three steps added to the bottom slab represent the Three Sources of Refuge — the Buddha, the Dharma and the Sangha. 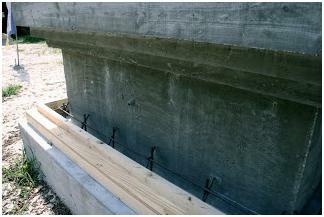 Here, boards are in place around the rebar, forming the first two steps. A few closer looks. 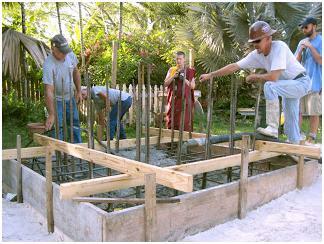 These steps can be formed and poured by Sangha members because they are not structural. 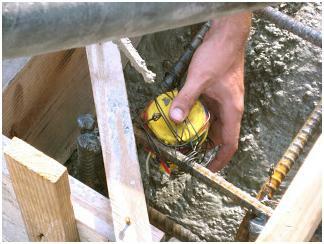 Close up of the work prior to pouring the cement. 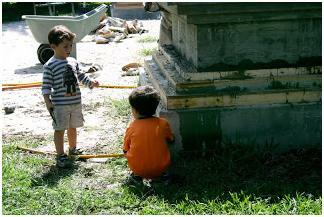 Even the smallest and the youngest can find a job on the stupa site — carefully supervised, of course! 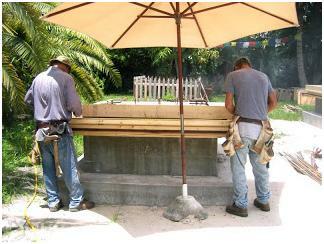 JP (Juan Pablo) on the left and his older brother Alejandro help out. 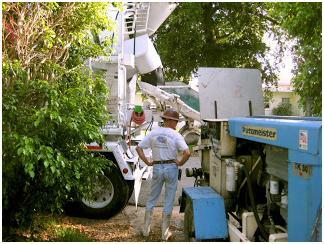 As with any good crew, every bit of work has to be discussed and the proper way to proceed has to be determined. 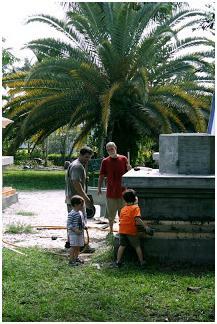 This stupa work is serious stuff! 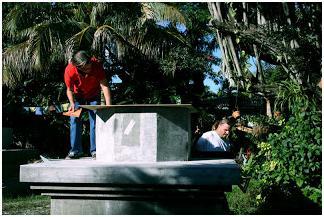 Last November, Rick Herpel and crew installed the main portion of the bumpa, the next level of the stupa. 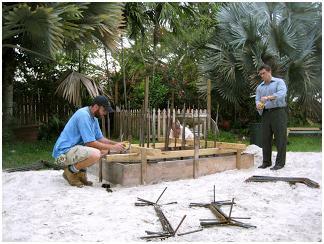 Here Rick is checking a diagram made at Herpel, Inc. that shows the installers points that need to match up on each stupa. The first bumpa is in place! The pieces were picked up by slipping wire rope attached to the bumpa over a forklift, raising it up about 8 feet until it was higher than the existing structure, then lowering it into place. 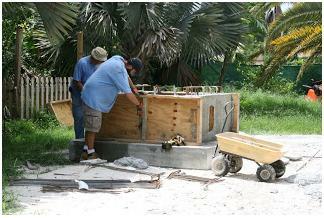 Rick Herpel checks out the first bumpa in place. 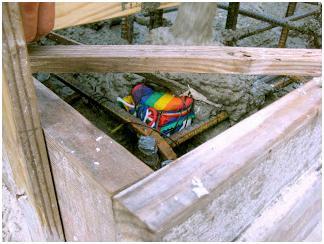 It’s on the Stupa of Complete Victory and we all felt victorious to have the first one up! Working on a bumpa as it hangs from the forklift. It’s up and coming! Installers wait for it to get close enough to attach. 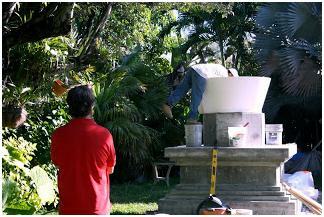 And it arrives on its stupa. The fourth one is on! This one was interesting as it didn’t have the attachments for the wire rope to lift it. Instead, it was lifted on the forklift and slid into place. These pieces are very very heavy and the installers had to hold it in place a couple of times which was amazing to watch. 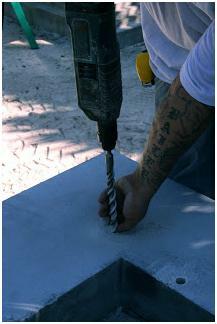 It was no trouble, however, and while it slid a bit on the mortar, the installers had control the entire time. A good look at the bumpa held by the forklift. Lovely — all four bumpas are installed and photographers (myself included) are clicking away. Cleaning up the mortar in between the base and the bumpa. These men did an incredible job. OK, here’s the crew but sadly, I’ve lost the paper where I had printed their names. All I’m sure of today is that Rick Herpel is on the left and the other three are happy the job is completed and has been done so well. A beautiful shot of the sun behind the bumpa. The door it’s shining through is the opening of the “gao” — also the name for amulets, some of which have this shape. 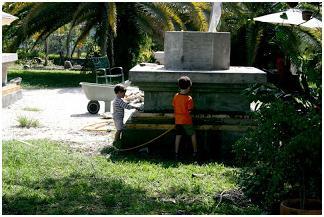 We couldn’t resist placing one of the Buddha statues where it will live when the entire stupa mandala is complete. 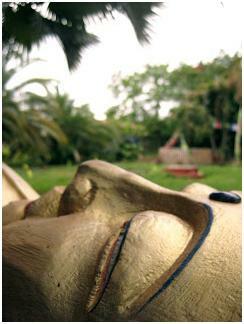 The statues were ordered by Lama Norlha Rinpoche, custom made in Nepal, and shipped to the US. Lama Rinpoche consecrated each of these beautiful statues which, as you can see, fit perfectly in the space set aside for them. 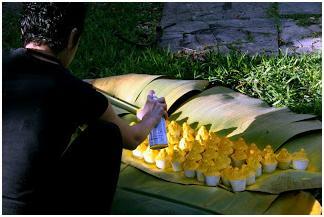 Now the sangha of Kagyu Shedrup Choling is making the tsatsa that will be placed inside the stupas. The power of a stupa doesn’t depend solely on the structure or architecture, but on the substances that are sealed inside. 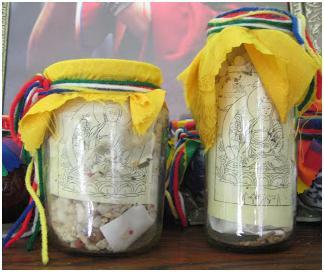 The more consecrated tsatsa that can be placed inside a stupa, the more powerful that stupa’s effect on the area it will protect. 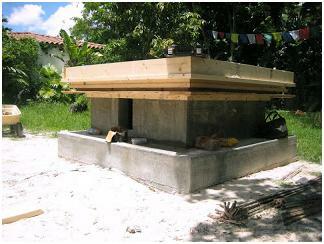 A stupa that has only a few tsatsa will not be of as much benefit. 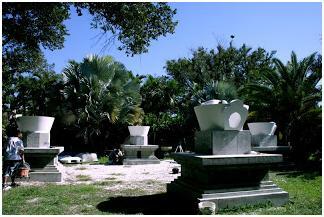 So, the stupas in the Garden of Merit will each be filled with thousands of tsatsa and with relics of masters of the past. 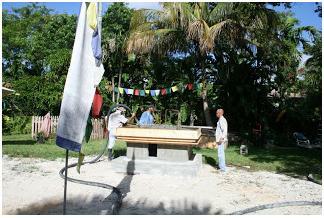 The blessings of these stupas will have a beneficial effect on South Florida for hundreds of years to come. The first painting of the first satsa! 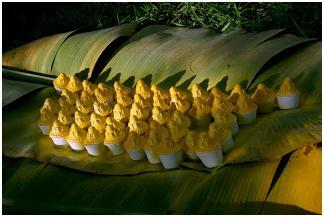 The tops are yellow and the bottom half will be red, as is traditional in Tibet. These are the first of 32,000 satsa that will be made, painted, consecrated and then placed inside the chambers of the stupas. 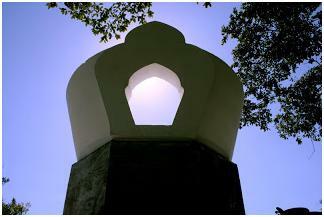 Each stupa should hold about 8,000 satsa. 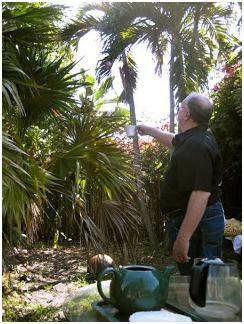 Shamelle finds a place to paint in the back yard on top of banana leaves from our trees. We’re trying two different spray paints for the tops. Brushes will be used to paint the bottom parts. Makes an interesting photo! 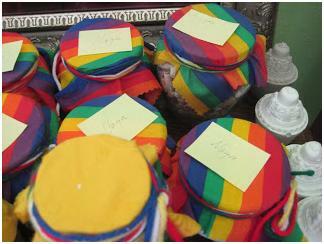 Some satsa will find their way into the Open Awareness Buddhist Center store for sale. 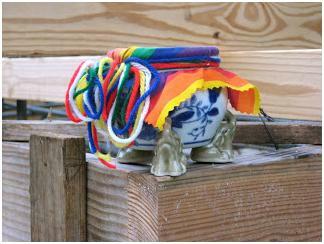 These are placed on shrines, sometimes in lieu of small stupas. 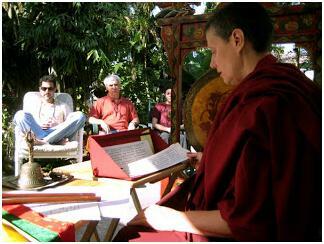 Next PostNext Chenrezig Chanting MOVED TO WEDNESDAY EVENINGS!